Shout out to TameikaG! She is still going strong and inspiring the masses with her story. Scroll down to read her story. Also, check out the awesome guest post she wrote for us on how she keeps health and fitness a priority despite having a busy schedule. I was another classic story of the girl who had been overweight her entire life. Growing up, I was the fun, jolly, overweight friend that everyone loved! I was in the arts, so performing was my life and it took up the majority of my time. Being active and playing sports was never a priority. Also, my family loves to eat. We’re of Jamaican descent and needless to say, but being health conscious was never of true importance. We just ate great food and ate it well! Traditional foods were a huge part of our culture and lifestyle. As I got older, the weight piled on. 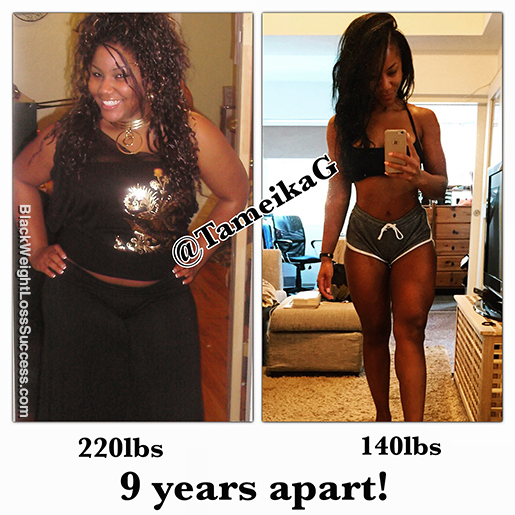 I went from being the cute, chubby Tameika to becoming severely overweight. After my first year of university and gaining yet another 20 pounds (forget the freshman 15), I’d reached 220 pounds. This is what became my breaking point. From that point on, there was no turning back. I was fed up with creating excuses and decided to commit… For good! I’m not a failure and I wasn’t about to start to become one. After many failed attempts, it was time. It started with small changes, then blossomed and then the changes snowballed into the healthy lifestyle you see today! 9 years later and I haven’t looked back! Now, I’m fulfilling my purpose to helping others! It all started (at the very beginning) with cutting out soda and juice! I used to have a lot of soda and juice daily. I saw the positive effects of that change almost instantly. Then, I decided to cut back on white sugar, so that included most sweets. The weight was melting off. The next thing to be cut was fried foods and then salt. All of this snowballed into a clean lifestyle as I began to feel amazing! It all started with group classes at the gym where I learned the basics. At the time, I couldn’t afford a trainer, so I took advantage of the well qualified trainers who held group classes. There, I learned the basics of weight training. Then, I did a LOT of research on my own. I decided to start with simple, basic weight training and again, like most people who become addicted to this lifestyle, it just snowballed! Current Weight: I range between 135-140 pounds. The lowest I’ve been is 130 lbs. 9 months. I’ve kept the weight off for 9 years. Educate yourself first. Create a plan that works for YOU. There are no shortcuts or cookie cutter solutions. Trial and error will be your norm. The only one that can change this is YOU, so it’s time to take accountability and just go for it. Stop making the excuses and commit. Congratulations and what a wonderful testimony on getting your health back. Another success story and you look amazing!!! You’re right no more excuses and only I can make this happen. I can’t wait to reach my goal and be able to share and motivate others. Thank you and much continued success to you! Congratulations on a job well done! These success stories let me know that I too can succeed at weight loss!